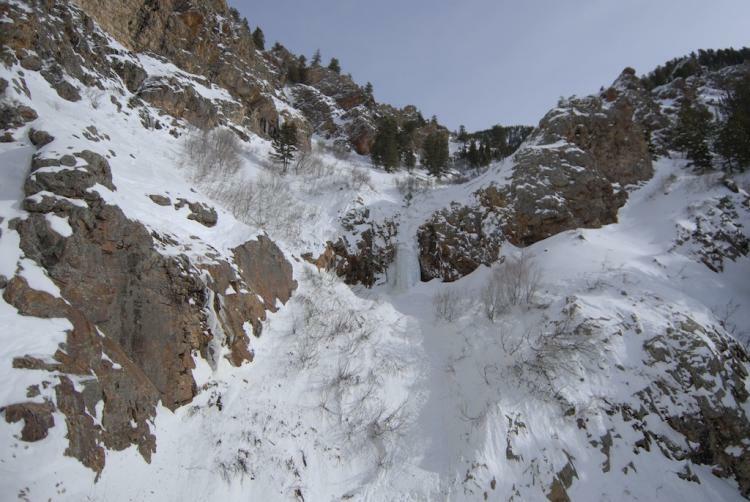 On the morning of Saturday January 28th four people in two cars drove up Big Cottonwood Canyon with the intent to climb the Argenta Slide Path. About 1500’ into the climb, one member of the party didn’t feel well and headed back to his car to return home. The three remaining, one skier (Josh A.) and two split-boarders (Alecs B. and Justin S.), pressed on. They gained the ridge, bumped into a well-known local skier, where they stopped and talked for a few minutes. 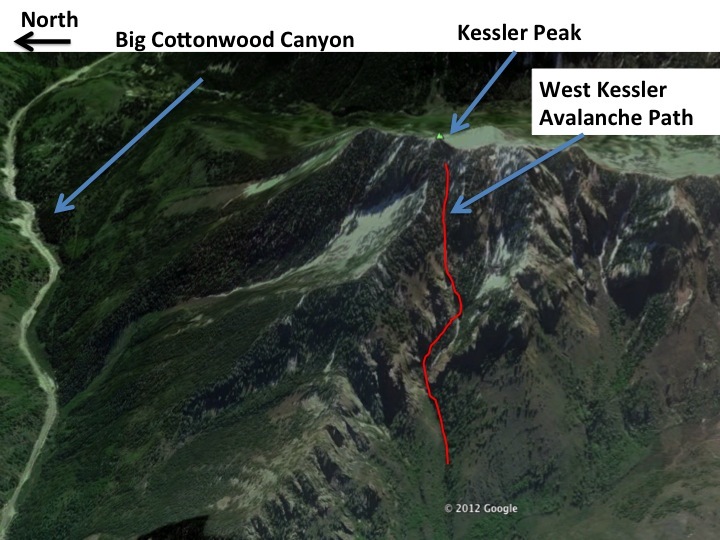 The three then headed south towards a steep, committing run north of the “Little Giant” located of the west face of Kessler Peak. Alecs Barton was in the lead and dropped into the slope while the other two maintained their spacing and watched their partner. Alecs descended through some trees and we he popped out onto the open slope he triggered a hard slab avalanche about 100’ above him at approx 11:22. The slide averaged 3’ deep, was nearly 1000’ wide and ran 2,500’ vertically. After Alecs disappeared, Josh and Justin quickly formulated a game plan and began descending the narrow couloir. Half way down the chute they encountered a 30’ plus cliff band they had to negotiate. The two continued down slope and encountered yet another cliff band where they decided to call 911 at 11:29 while they still had a cell signal. 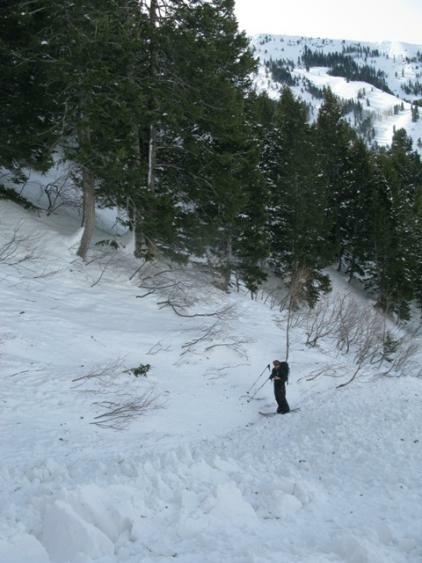 Josh continued down slope into the avalanche debris filled gully. He got a signal, continued downhill, but quickly realized he was below his partner as the signal faded. He hiked uphill as Justin arrived and began probing. The first strike was a false positive and as Josh shoveled he realized he had hit a tree branch. Justin continued probing and struck Alecs foot moments later. The digging began and they uncovered his legs followed by the rest of his body. Josh and Justin began CPR. 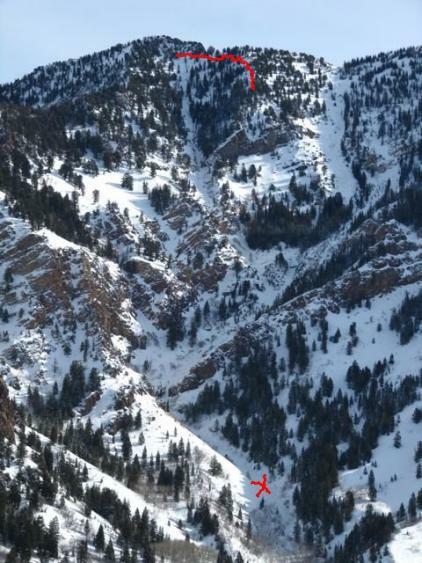 At this juncture the Wasatch Powderbird Guides (WPG) helicopter was heard in the canyon, but Josh and Justin noticed it was heading up canyon and away from them. Josh decided to pull his ABS so the heli could more easily spot them from the air. 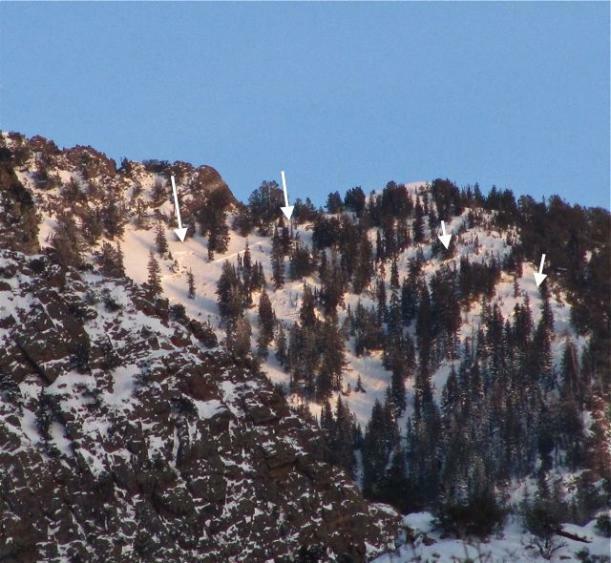 Within a few minutes the heli returned, was above them, and dropped off two members of Wasatch Backcountry Rescue (WBR) who assisted on scene. Given the terrain features this was remarkable rescue by not only the trained professionals of WPG and WBR, but also from Josh and Justin who maintained composure under extremely difficult physical and emotional conditions. The mere fact that they were able to negotiate the extremely challenging terrain which barely had enough snow left in it and continue with a solid well managed rescue is a testament to these two young men’s background in both mountaineering and medical training. All members of the party had avalanche rescue gear. 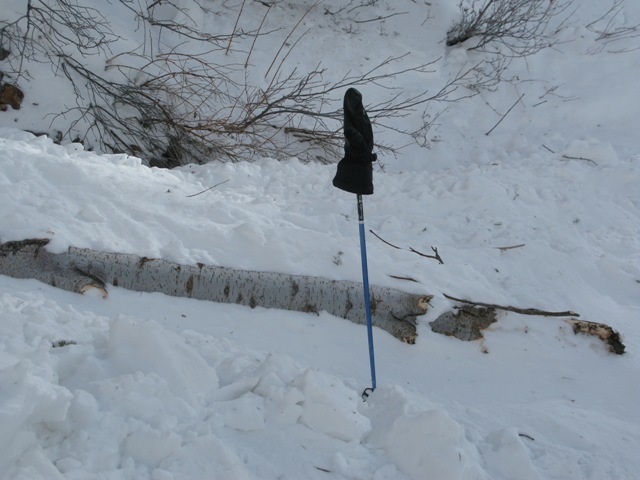 It’s unclear if Alecs had consulted the avalanche advisory that morning, but he had been in the general area a few days before and was aware of the snowpack structure on nearby slopes. No snow pits were dug, but survivors indicated they tested the snow throughout the tour with pole stabs and felt good about stability. Both Alecs and his splitboarding partner were familiar with the terrain and had descended the slope at least once last season. On the day of the avalanche, the advisory's bottom line read, "Very dangerous conditions exist in the backcountry. 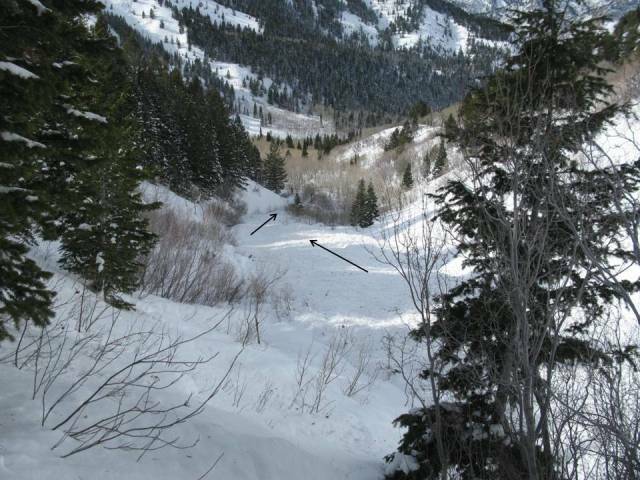 There is a CONSIDERABLE avalanche danger for triggering deep slab avalanches and a MODERATE danger for triggering any new or old wind drifts. It’s not HIGH danger anymore, but the travel recommendations remain the same. I’d avoid the steep west to north to southeast facing slopes at the mid and upper elevations. It went on to say, "t’s gonna be one of those days - Bluebird, light wind, 5 star powder (for this year anyway). Truth be told, it’s also days like these where we see avalanche accidents. Discipline, self-denial – these are things we not only aspire to – it’s what keeps us alive in conditions like these. 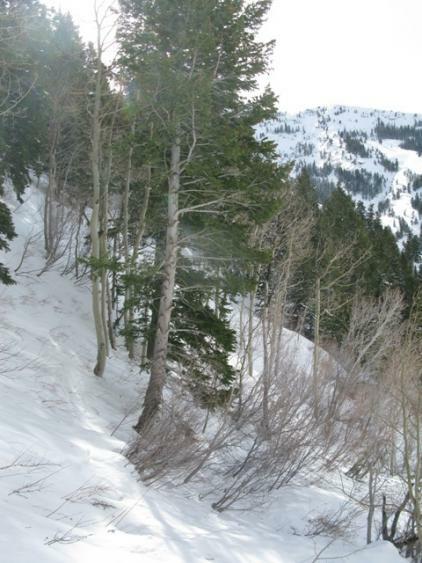 Even – perhaps especially – if you see other tracks on the slope. Or that others are getting away with it. It has applications in other parts of our lives as well." Looking down the path of debris, WPG set their ship down near the closest arrow about 75' uphill of where Alecs' partners located him.